As a self-declared “summer person” August is always a little bittersweet for me. Five minutes ago it was May, and all of a sudden back-to-school supplies are on store shelves. Which shouldn’t matter to me – it’s been years since I’ve been in school – but the thought of notebooks and number two pencils still sends a little chill up my spine. No matter how old I am, I’ll never be quite ready to let the summer go. 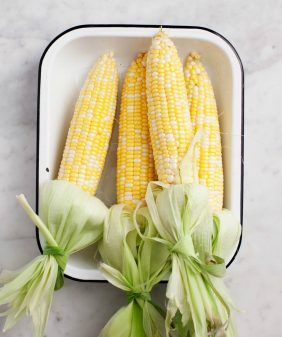 Today’s recipes use all of my favorite late summer produce – zucchini, summer squashes, peppers, corn, eggplant, and (the one I’ll be most sad to see go): peaches. These are some of our all-time favorites and I hope you enjoy them as much as we do! 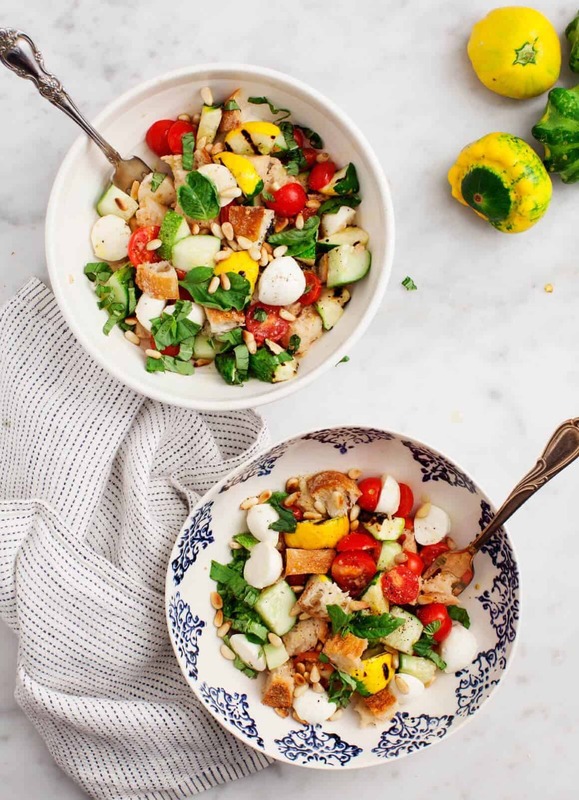 Patty Pan Panzanella: (pictured above) A hearty veggie-filled salad using sauteed summer squash, cucumbers, tomatoes, day-old bread and tons of herbs. 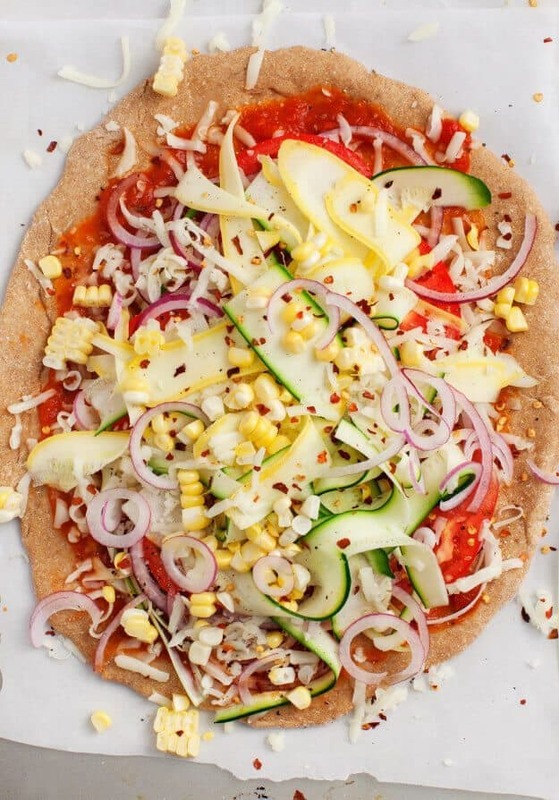 Summer Squash Vegetable Pizza: When it comes to pizza, I usually think less is more – but when you’ve got tons of zucchini and you’re up to your ears in corn – pile it all on. This one is messy to eat, but it’s a fun way to eat SO many summer vegetables. Summer Squash Orecchette: More zucchini, I know, but don’t you have tons of it? This simple pasta with rosemary and lemon is a light, yet satisfying. 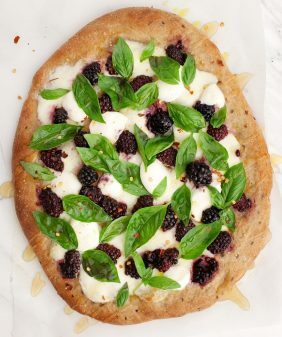 We like to make this one on Sundays with a glass of rose, but it’s easy enough to pull off any night of the week. 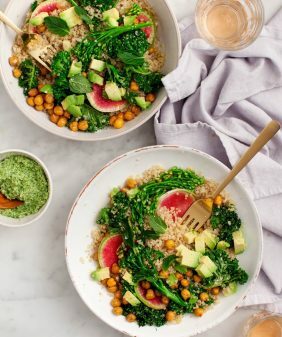 Peach Salad with Mint and Pistachios: This salad is one of my absolute favorites – peaches and mint are not only a winning combo, but they’re so delicious over a f zucchini noodles with a dollop of savory spiced coriander yogurt. Peach & Plum Crumble: One of my summer goals is always to consume as many peaches as possible. This crumble recipe will work with any in-season fruit, but it’s my absolute favorite with peaches. Grilled Eggplant Pesto Sandwiches: I always get asked “what do I do with eggplant,” and my first reply is always “grill it!” If you’re afraid of working with eggplant, give this one a try. Eggplant and Roasted Tomato Farro Salad: When we came home from Rome last summer, this was the first meal that I recreated, inspired by a terrific salad I had at Roscioli’s. I love the concentrated super sweet flavor of slow roasted tomatoes – they’re so good with meaty eggplant, chewy farro and peppery arugula. Make a big batch and keep this salad around all week. Its a great picnic lunch. Tostadas with Smoky Sweet Corn Hummus: A corn trifecta – smoky sweet corn hummus on top of corn tortillas, topped with grilled corn (and avocado and tomatillo salsa). Corn, Cucumber, Peach & Avocado Salad: Last but not least, my favorite salad that I created so far this summer – the name kind of says it all – it’s full of all my favorite fruits and vegetables, tossed with a creamy chile-lime dressing. 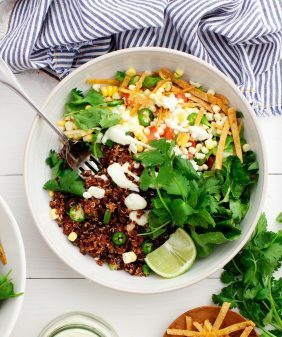 It’s summer in a bowl. Tonight we’re having pasta with raw chopped tomatoes and mozzarella. 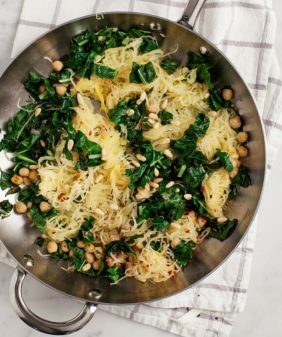 It’s just right for summer–not so “comfort foody” as pasta with sauce. Also basil, but I just put it on my pasta, since the rest of the family picks it out. All of these look superb, but I absolutely must try that sweet corn hummus! I love that you put chipotle in it to give in an extra kick. I haven’t really accepted that summer is at its end. These recipes look great, though! 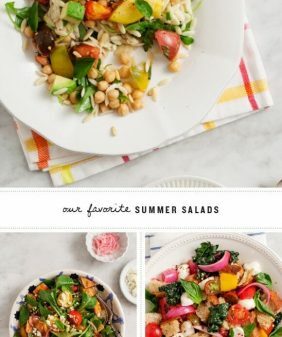 Amazing recipes, I can’t believe summer is almost over, definitely got to try these out! I love this post and am making most of them this week! (A few of these were alreay favestoo.). I would be thrilled to see more posts like this to assist with menu planning. The eggplant and roasted potatoes as well the the corn, cucumber, peaches and avocado both look so delicious. They are all perfect, colorful dishes for the end of summer but we’ll have to try these two. Your blog is BEAUTIFUL. I love these recipes and your photography is lovely.